Cube Designs and its team members have accomplished major projects with everyone from Fortune 500 companies to fresh start-ups, seasoned large independent companies as well as Mom & Pop businesses alike. We cater to any business in need of strategic furniture purchases, covering the full scope of space planning, project management and installation required to complete several hundred-person facility build-outs. We can supply the end-to-end solution to see even the most complicated large-scale projects through to a successful starting day. Below are just a few of the companies we have helped through the years. 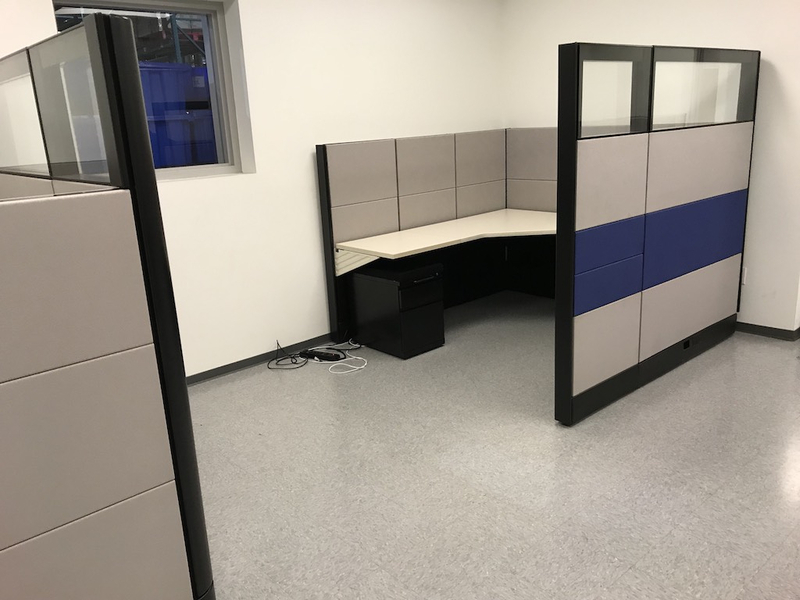 Custom Tailored Ethospace Cubicles. This client picked the color concept and layout design. Every part was converted from a pre owned inventory using new work surfaces, new fabric and custom color trim. Additional accessories include acoustic tile inserts for sound protection, end glass top tile inserts for an aisle way open concept. The HR private office had custom cubicles created for each assistant's individuals needs. 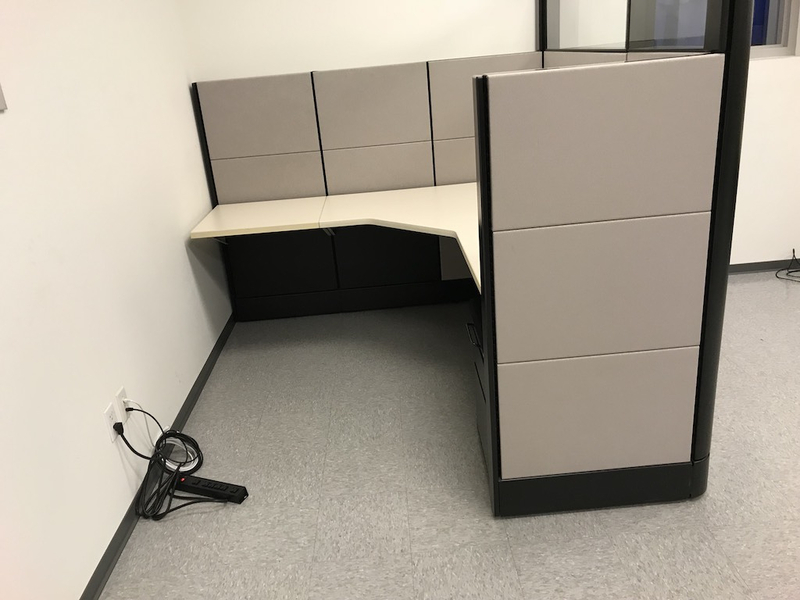 We installed custom Herman Miller Ethospace Cubicles. Scope of work included creating 4) 6' x 6' low wall/ high wall units to allow the natural light to come in for the operations section. Next phase was a pack of 6 units, 6' x 6' for the sales department. Final units were larger at 8' x 6' for the managers section. 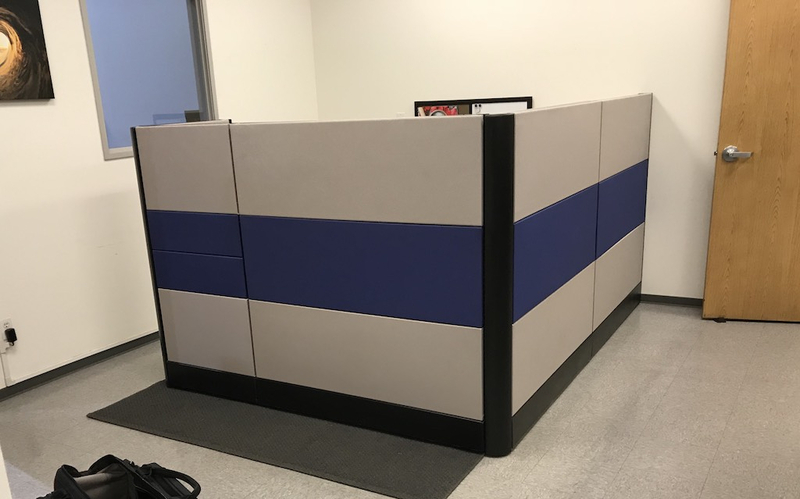 Installed 12) 6' x 6' x 54"H Bullpen Style Cubicles with custom new fabric and new white work surfaces. Each unit also included a new Height Adjustable Table and 12) Pre Owned Leather Seat Pan Steelcase Think Mesh Chair Drafting Stools. Installed 5) 8' x 8' x 70"H Herman Miller Ethospace Cubicles adding Frosted Top Tile Glass to the End Wing Panels. “Everything’s been delivered and installed. First of all, let me say that I’m a hard person to please when it comes to service. I have a background in sales and service and have always made sure I went above and beyond my clients’ expectations. I usually find that service is sorely lacking with most companies and individuals I do business with. I’m pleased to say, that’s not the case with Cube Designs and their team of experts! Cube Designs was a great company to work with. Brandon, our sales person, found exactly what we wanted and offered a few pieces that we didn’t even request. He was patient with all my requests and set expectations appropriately. Their installers, Armando and his partner, were top-notch. They let us know ahead of time when they’d arrive. They were on time, worked quickly and efficiently, and communicated with all the staff throughout the process. Armando let us know early in the day that we’d need to change the end of the wiring harness because the previous tenants hadn’t provided power to the old cubicles correctly. With the heavy workload our facilities manager was already under, I could tell his level of stress went up when he heard this. Armando helped alleviate the stress and lighten the mood, making everyone laugh. This is definitely the installation team I want the next time we get cubicles and furniture! Installed 8) 6' x 6' x 62"H Herman Miller Ethospace Cuticles with Top Tile Glass. All Pre Owned.. 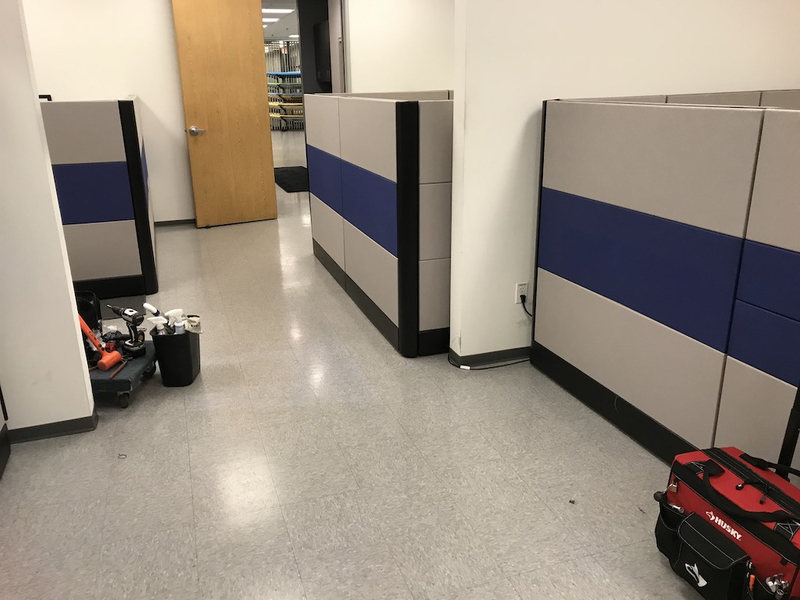 Installed 8 Pre Owned Herman Miller Ethospace Cubicles with an additional end aisle Top Tile Glass piece, a blue fabric tile and Overhead Storage. "I want to thank you for the excellent service and product you provided my company. When I first contacted you I only had a vague idea of what I wanted. With your help and the professional CAD drawings you did for me, we were able to develop the perfect space plan for my project. Once we had that in hand, seeing actual examples of the cubicles in your showroom helped us decide on a specific type. In our case, we opted for used cubicles. When the quote came in, the price was fair and competitive so we approved the project and awaited installation. Your installation team arrived on schedule and did a great job installing the cubicles. I was very satisfied with the quality of the used cubicles. In fact, most people think they are new. In summary, I could not be more pleased with the outcome of the project and the service you provided. Thank you for all you did to help us."